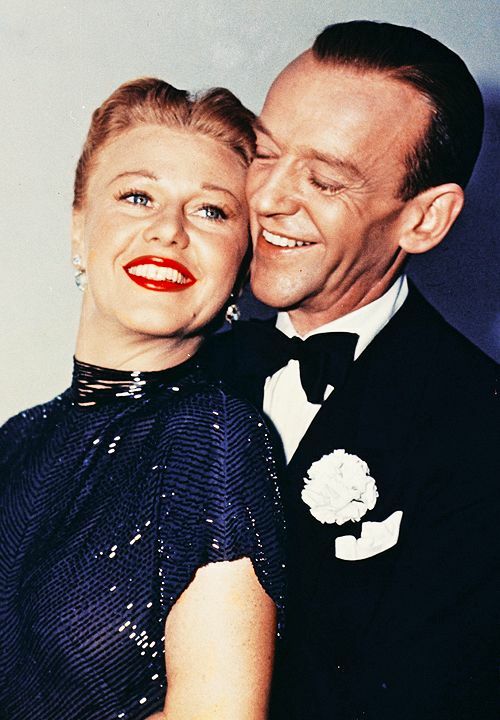 TCM is airing five movies starring Ginger Rogers and Fred Astaire this week. Every Monday in June, TCM is airing the films of actress and fashion icon Audrey Hepburn. This week features some of her best later roles, including How to Steal a Million (1966) and Wait Until Dark (1967). There's also a day of stage plays that were made into films and a lineup of movies starring Louis Wolheim. I'll go in-depth on each film a little further down in the article, but first here's a quick rundown of what else is on the schedule. Birthday tributes: Dame May Whitty on Monday. Noir Alley: Psychiatrist Audrey Totter gets inside the head of possible wife murderer Robert Taylor in High Wall (1947) at 10 a.m. Sunday. TCM Essentials: James Stewart and Grace Kelly witness a murder in his apartment building in director Alfred Hitchcock's thriller Rear Window (1954) at 8 p.m. Saturday. Silent Sunday Nights: 18th century Frenchman Ramon Novarro fights for the oppressed and the hand of the beautiful Alice Terry in the swashbuckler Scaramouche (1923) at midnight. Best Day to DVR: Friday daytime. TCM is airing five of the nine musicals dance team Fred Astaire and Ginger Rogers made at RKO Pictures starting with the duo's first film, Flying Down to Rio (1933) at 11:30 a.m. followed by two of their best films, Top Hat (1935) at 1 p.m. and Swing Time (1936) at 2:45 p.m. Carefree (1938) at 4:45 p.m. finds shrink Astaire falling for wacky patient Rogers. 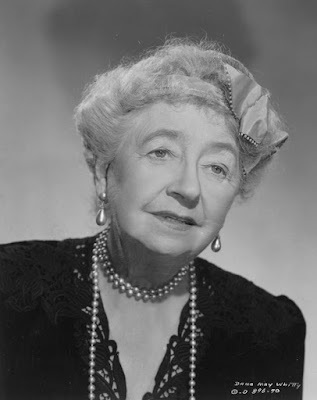 Finally, there's the biopic The Story of Vernon and Irene Castle (1939) at 6:15 p.m.
Three daytime picks: A birthday tribute to Dame May Whitty who was born Mary Louise Whitty June 19, 1865, in Liverpool, England. After a successful stage career, Whitty began appearing in films in the late 1930s, where she played variations on aristocratic English ladies in movies like director Alfred Hitchcock's thriller Suspicion (1941) at 8 a.m. and the noir My Name is Julia Ross (1945) at 1:15 p.m. One of Whitty's last roles was as a small-town busybody in The Sign of the Ram (1948) at 6:30 p.m.
Prime time lineup: TCM is celebrating the career of leading lady Audrey Hepburn each Monday in June. This week's prime time selections include two of her sixties roles: First, as an art thief opposite Peter O'Toole in the sprightly caper movie How to Steal a Million (1966) at 8 p.m. and then as a blind woman who is tormented by violent drug dealer Alan Arkin in Wait Until Dark (1967) at 10:15 p.m.
Late night pick: One of Hepburn's best early roles was in the thriller The Secret People (1952) at 1:45 a.m. She plays the younger sister of a woman (Valentina Cortese) who is hired to assassinate a dictator. 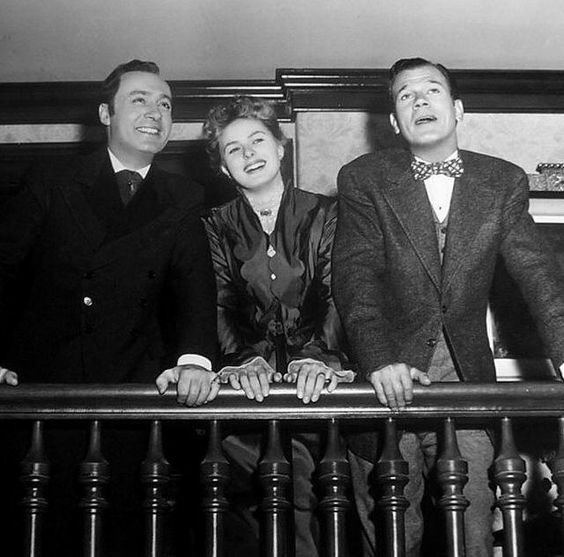 Charles Boyer, Ingrid Bergman, and Joseph Cotten on the set of Gaslight (1944). Three daytime picks: The theme is stage plays that were made into movies starting with the 1944 adaptation of Patrick Hamilton's thriller Gaslight at 8 a.m. starring Charles Boyer as a fortune-hunting husband who tries to drive his fragile wife (Ingrid Bergman) crazy. (Another version of Hamilton's play, starring Anton Walbrook and Diana Wynyard was filmed in 1940. It's on at 3:45 a.m. Monday night/Tuesday morning). The first of many adaptation of the Ben Hecht-Charles MacArthur newspaper comedy The Front Page (1931) is on at 10 a.m. Finally, James Stewart and the rest of the Broadway cast reprise their roles in the Pulitzer Prize winner Harvey (1950) at 6 p.m.
Prime time lineup: A night of movies starring Louis Wolheim, who was a sought-after character actor in twenties and pre-code Hollywood. Wolheim plays a fearsome bootlegger who intimidates kid brother John Gilbert in the pre-code gangster saga Gentleman's Fate (1931) at 8 p.m. followed by another memorable mobster role in the silent The Racket (1928) at 9:45 p.m.
Late night pick: Wolheim got the chance for a delightful change of pace in the silent comedy Two Arabian Knights (1927) at 2:30 a.m. about two World War I soldiers who bumble their way through the Middle East. Dean Martin in Some Came Running (1958). 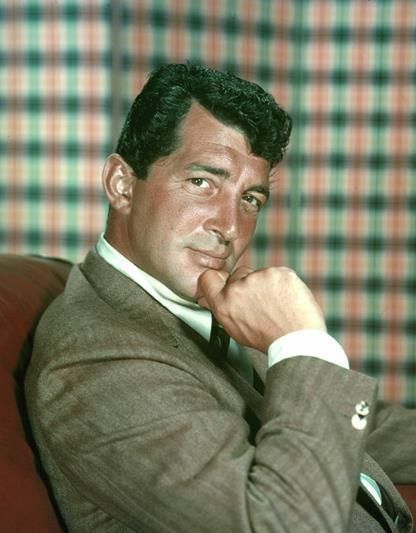 Three daytime picks: The theme is color movies directed by Vincente Minnelli, who, in my opinion, produced old Hollywood's greatest Technicolor films, including the Academy Award-winning musical An American in Paris (1951) at 6 a.m. Minnelli was equally adept at helming dramas like the downbeat study of Postwar alienation Some Came Running (1958) at 2:15 p.m. starring Rat Packers Frank Sinatra and Dean Martin in two of their most powerful onscreen roles. The afternoon lineup is devoted to the early films of director Francis Ford Coppola, including the low-budget horror flick Dementia 13 (1963) at 4:45 p.m. It's about an Irish family's macabre competition for a family fortune. Prime time: A night of cult classics starting with the black comedy Harold and Maude (1971) at 8 p.m. about the unlikely romance between an alienated teenager (Bud Cort) and an eccentric octogenarian (Ruth Gordon). Next is the rock 'n' roll mockumentary This Is Spinal Tap (1984) at 10 p.m.
Late night pick: The bizarre horror/circus film Freaks (1932) at 11:45 p.m. is perhaps old Hollywood's first cult movie. Sydney Greenstreet and Joan Crawford battle it out in Flamingo Road (1949). Three daytime picks: The theme is movies about secrets and scandals starting with Walter Pidgeon as a kindly English village resident who sets tongues wagging when he takes in a young girl (Janet Leigh) in If Winter Comes (1948) at 8:45 a.m. Reflections in a Golden Eye (1967) at 2:30 p.m. follows the secrets and scandals of those on a Southern military base. 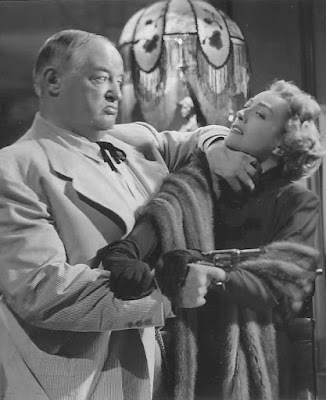 Finally, belly dancer turned diner waitress turned businessman's wife Joan Crawford exposes corrupt small-town sheriff Sydney Greenstreet in the noir Flamingo Road (1949) at 6:15 p.m.
Prime time lineup: TCM is putting the spotlight on gay Hollywood every Thursday in June with movies from actors, directors, and screenwriters who were part of the LGBT community. Tonight's lineup features two gay men who worked behind the scenes. Arthur Laurents wrote the book for the Broadway musical Gypsy, which was made into a 1962 film starring Rosalind Russell and Natalie Wood. It's on at 8 p.m. John Schlesinger directed the charming comedy Billy Liar (1963) at 10:45 p.m. about a meek Yorkshire man (Tom Courtenay) who retreats into an elaborate fantasy life. Late night pick: Jerome Robbins was one of the great American choreographers in ballet, Broadway, and films like West Side Story (1961) at 5 a.m.
Prime time lineup: If you can't travel abroad this summer, you can take a European vacation on TCM every Friday night in June. 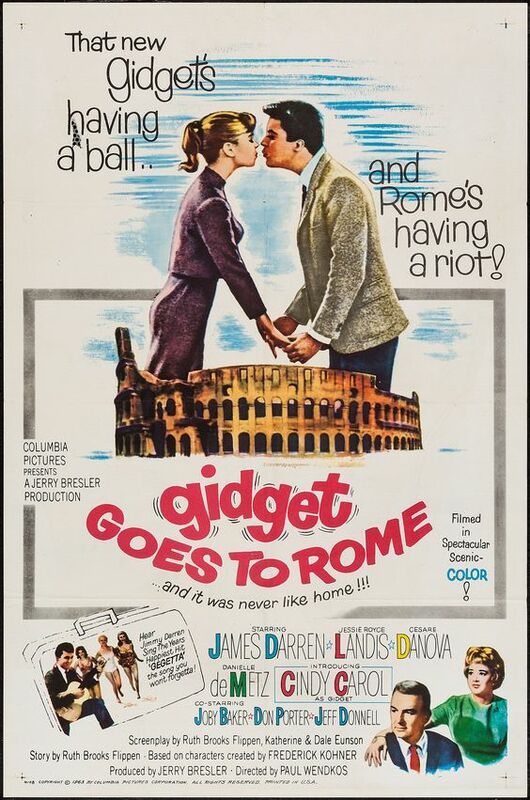 Tonight's films are set in Rome starting with librarian Suzanne Pleshette finding love in the Eternal City in Rome Adventure (1962) at 8 p.m. followed by wealthy businessman Rock Hudson romancing Gina Lollabrigida in Come September (1961) at 10:15 p.m.
Late night: Surfer girl Gidget (Cindy Carol) and her main squeeze Moondoggie (James Darren) spend a summer in Italy in Gidget Goes to Rome (1963) at 5 a.m. The Essentials series continues at 8 p.m. with new host Alec Baldwin. He will be joined by his former 30 Rock costar Tina Fey to discuss director Alfred Hitchcock's thriller Rear Window (1954) at 8 p.m. followed by two more films about eyewitnesses to murder: Young Bobby Driscoll can't get adults to believe he witnessed a murder in The Window (1949) at 10:15 p.m. (Driscoll earned a juvenile Oscar for his performance). Next, Barbara Stanwyck tries to convince the skeptical police that her neighbor (George Sanders) is an ex-Nazi killer in A Witness to Murder (1954) at 11:45 p.m.
TCM's prime time lineup is all about actor Mark Stevens. He was a popular leading man in the 1940s often appearing in noirs like the gangster drama The Street with No Name (1948) at 8 p.m. in which he plays an FBI agent who goes undercover to infiltrate the mob. Stevens played the loyal husband of mental patient Olivia de Havilland in The Snake Pit (1948) at 10 p.m.